This piece by the American Journalism Review is dedicated to newsrooms of years past. Back in the days when white men from blue-collar backgrounds got reporting jobs without journalism degrees, sometimes because they failed at everything else. They played pranks on each other, cursed each other and even physically fought each other. When computers, corporations and women arrived, things got a bit sanitized. They were a little neater, a little more proper. Money troubles made things worse. I can’t quite identify with being a white man in a male-dominated newsroom of the ’70s, but I can relate to the passion, the sense of duty, the cynicism and idealism of it all. The work attracts interesting people, for sure. We are misfits, stubborn, daring, foolish. When an ambulance wails in the streets, it piques our senses, but probably not for the reasons it does for others. It’s something that many did and continue to do despite the low pay; it’s something many do for free. At a time when newspapers and media professionals are at a crossroads, it’s hard to tell whether such an environment can ever be replicated. 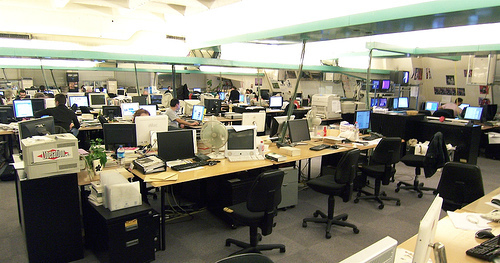 For one thing, morale is low in many newsrooms; people are expected to do more with less. Further, many of us are jobless or heading in a new direction. I can’t tell you how often I’ve spoken with young journalists, all so talented and passionate, who question the paths they’ve taken. They suggest that perhaps they should go back to school to do something less unstable. For all the newsosaurs’ romanticizing and nostalgia for the past, at least they had the fortune of having one. By the time I got to a real newsroom, I knew my days were numbered. The closest I got to such revelry was in college. I mean, not that I participated in any misdeeds in college. Or know of any for that matter. There was one particular morning, though, when the newspaper halls’ dented walls and tire-marked wooden floors left the staff wondering what had happened the previous night. Coincidentally, it was the morning after we produced the paper’s last issue of the school year. Even the business department wasn’t immune. Their chairs bore the scratches likely acquired from whatever happened in the hallway. The newsroom’s chairs, meanwhile, miraculously survived unscathed.